Traditional Christmas Treats that is!! 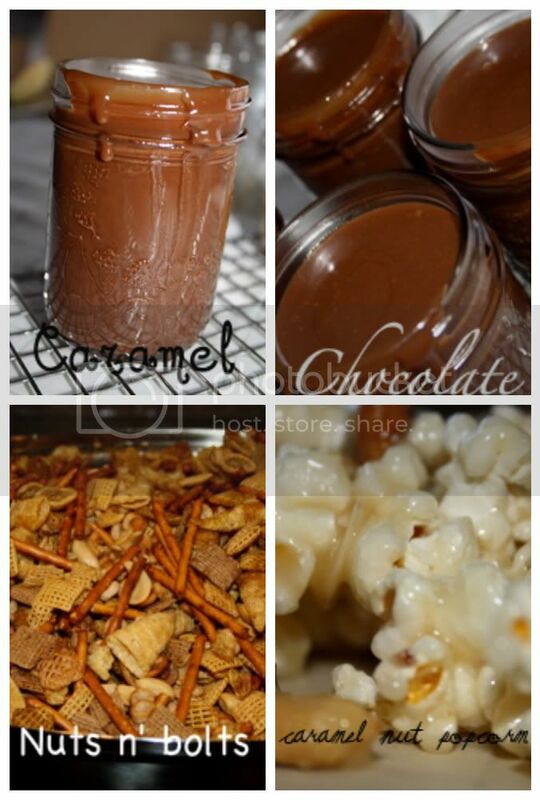 In our home we have always since I can remember had homemade nuts n bolts and caramel nut popcorn! Over the last few years we have added into the joy with caramel and chocolate sauce! My dad and I spent all day slaving over the stove ( literally I spent hours standing at the stove stirring and stirring) the baking started at 9:30 and went until 3! What comes out of the hard work is scrumptious!! Here is the recipe for the Popcorn. This one is special to us! It helps us feel like my grandma is just a little bit closer to us during the holidays, since she used to make this for my dad and his sibling every Christmas! you can also add whatever nuts you like! we also put cashews in which are my fav! How to: spread out parchment paper on to flat surface. as soon as it comes to a boil set a timer for 6 minutes and let boil while continuing to stir. When 6 minutes are up remove from heat and add 1 tsp vanilla. Immediately pour over corn and nuts and stir! You need to work quickly because the sauce gets stiff quickly! Spread out on parchment paper and let cool!! Then eat it all up!!! It is fantastic!